The emotionally charged issues of public education are the focus of Daniel Barnz’ Won’t Back Down. Creating a film intended to give hope to parents and teachers who are struggling with inadequate community schools, he delivers a film that is inspiring while at times manipulating our emotions. Based on recent unsuccessful attempts to use the “parent trigger law” to take control of two elementary schools in California, this fictional motivational story is a moving tale that reminds all of us that the focus of education must be the children, especially the children whose parents’ poverty places them in neighborhoods where their local schools are failing them. Written by Barnz and Brin Hill, the central character is a determined mother whose dyslexic daughter is not only being left behind but also being bullied by her teacher and classmates. 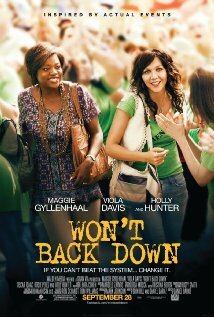 Jamie Fitzpatrick (Maggie Gyllenhaal) works two jobs to provide for her third grade daughter Malia (Emily Alyn Lind). When Malia is transferred to a school which has had multiple years of receiving an “F” for their education program, Jamie sets out to find a solution. Coming up against an indifferent bureaucracy that is more concerned with protecting the status quo than helping the students, her entrepreneurial spirit takes her to the district offices and a chatty receptionist played by Lucia Forte. Informing Jamie of the new law that empowers parents and teachers to take control of a failing school, she is also informed that the teachers’ union and the school board make it impossible to do so. But this does not dissuade Jamie from her crusade. Joining Jamie’s crusade are two gifted teachers who she reminds why they originally became teachers, the haunted but extremely competent Nona Alberts (Viola Davis) and the charming but lonely Michael Perry (Oscar Isaac). When this unlikely team becomes successful in garnering the signatures required to gain a majority of the parents and teachers to trigger the law that empowers them to take over the school, they soon become the enemies of both the school officials and the teacher union. Although the leader of the union is presented in caricatured form, his assistant Evelyn Riske (Holly Hunter) is not. Evelyn is a gifted teacher who entered the profession because of the children, but left the classroom to pursue her parents’ dream of union leadership. When told by her boss that the teachers’ union does not care about the children because they do not pay union dues, Evelyn wakes up and is restored to both her identity and her passion. We won’t spoil what else happens or what sacrifices this journey requires, but the message is one of hope and encouragement. That we have schools where children and their futures are being discarded due to lack of finances and wise leadership is a reality. That we can do something to turn this around is a call to which we should all respond. This film is a vision of what we can do if we all put the children first. 1. The nature of institutions such as school districts or labor unions often causes people within them to make decisions good for the union or the administration rather than the children they are supposed to serve. What do you do when your employer, institution or union asks you to set aside the children, clients, customers or patients you serve? How do you stand up and not back down when pressured with the loss of your job? 2. This film is designed as a motivation piece to stand up for children’s education. Did you experience it as inspiring or manipulating? Why do you answer as you do? 3. In real life discussions of improving public education, another option presented in these efforts are groups or companies trying to form charter schools. Why do you think this option was left out of this story? Is its absence purposeful or a deception? Why? Posted on February 9, 2014 by Cinema In Focus and filed under 4 STARS, INSPIRING and tagged 4 STARS INSPIRING 2012 PG RATED DRAMA.